Yet another Swan-outfit, this time inspired by the Lothlórien Swan theme. 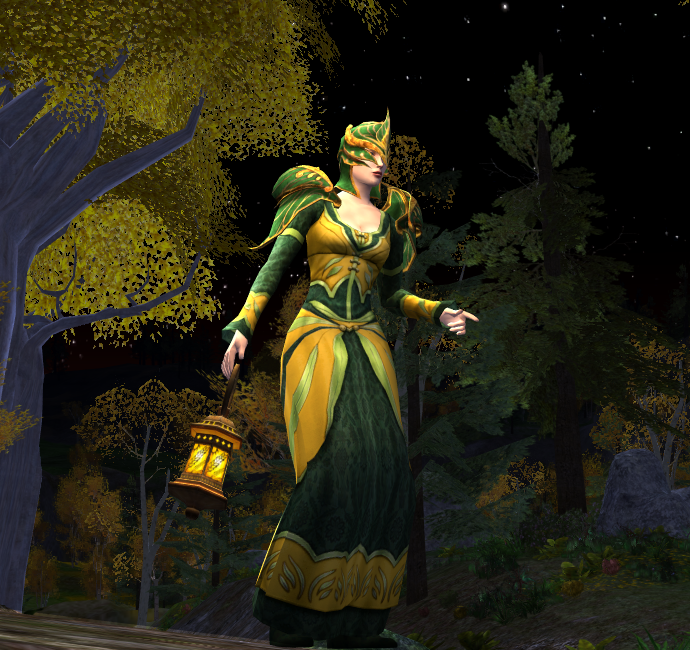 Lothlórien is the most enchanting and alluring area in Lotro’s Middle-earth. The design and lighting of this magical place, as well as the music, genuinely capture the solemn spirit of the elves. Using some of the swan pieces from the Dol Amroth armour sets, I tried to reflect that feeling in an outfit. The Light Nadhin Hood has a bit of a translucent quality to it, which makes the colors appear very soft and gentle when dyed. The same is true for the matching Light Nadhin shoulders, but I decided not to use those here and go with the heavy set in stead, to emphasize the swan theme. The hood leaves the neckline open, which is an uncommon feature for Lotro hoods, yet very desirable because it’s so elegant with robes. Time suddenly stood still as I gazed upon this masterpiece! Everything slowed down and I heard soft haunting music and the slight ripple of water from a stream or lake shore. The beauty and ethereal quality of this outfit speaks of age old elves and their eternal kingdoms. The hood is a nice piece for this outfit, soft and concealing. as if she is mourning a time to come, when all elves depart. The robe is spectacular and fits well with the shoulders. And I have to say, the background makes me sigh in relaxation. I could use this screenie as a wallpaper! Well done, Hymne! Thank you Ked, your kind words leave me blushing! One has to admit that all credits for the setting go to the Lotro designers of course, who really brought the mythical and eerie quality of Lothlórien to life in this game. Trying to capture that feeling in a screenshot is not always that easy, but my elf minstrel kindly helped me out by striking exactly the right poses wearing this wonderful garb. Thank you Gloredh, coming from you I take that as a very special compliment, considering the fact that the elvish and Lothlórien outfits and screenshots on your own blog are masterpieces by themselves. There is nothing like that dreamy atmosphere in Lórien, and truly these pieces worked so well together. I’m going to be using this ensemble for quite a while to come. Such a beautiful and otherworldly outfit, Hymne! It’s a remarkable fusion of Dol Amroth and Lothlórien pieces. That hood is very special indeed as it fuses with the chest piece. The Nadhin pieces are of great quality and can be used for many different styles. Let’s see what else we can do! All I can say is.. wow. This outfit literally blows me away. The colors are so gentle and subtle, and so flowy. The screenshots are remarkable as well. Amazing job on this, Hymne! Thank you so much Makaia, I really enjoyed making this one!